While she was working last week, U.S. astronaut Anne McClain realized that she needed a medium-size suit for spacewalking. That is not one small step for women. History was supposed to be made Friday when, for the first time, two female astronauts were scheduled to do a spacewalk together outside the International Space Station. However, one of the astronauts was switched out this week because of a lack of "spacesuit availability." NASA astronaut Anne McClain had trained in both medium- and large-sized upper torsos — what NASA calls "the shirt of the spacesuit." But last week, she wore a medium on her first spacewalk, where she helped swap out aging batteries that store energy collected by the station's solar panels. "Based [on] her experience in the first spacewalk in the series, McClain determined that although she has trained in both medium and large torsos, the medium, which she wore last Friday during the spacewalk, was a better fit for her in space," NASA spokeswoman Stephanie Schierholz told NPR in an email. Two mediums existed on the ISS, but only one was prepped for a spacewalk. Instead of devoting extensive crew time to make the extra medium-sized suit space-worthy by Friday, NASA decided to restaff: Nick Hague will go in McClain's place and do the walk with Christina Koch. "When you have the option of just switching the people, the mission becomes more important than a cool milestone," Schierholz told The New York Times. Preparing a spacesuit for exposure to the vacuum of space is no easy task. Last week McClain posted a video of her doing a "loop scrub" on a suit, necessary to keep the cooling system running properly. Astronauts also conduct several fit checks as they prepare for spacewalks, according to Space.com, as astronauts grow taller in the microgravity of space. In fact, McClain said on Twitter earlier this month that she had already grown 2 inches in the few months she's been on the ISS. NASA hadn't actually been intending to make history; only after the two female astronauts were scheduled together did they realize it would be the first all-female spacewalk. "It really is the luck of the draw," Schierholz told Space.com. The 39-year-old McClain spoke to NPR last month about how it felt to achieve her dreams. "I will probably spend the rest of my life trying to describe it," she said. 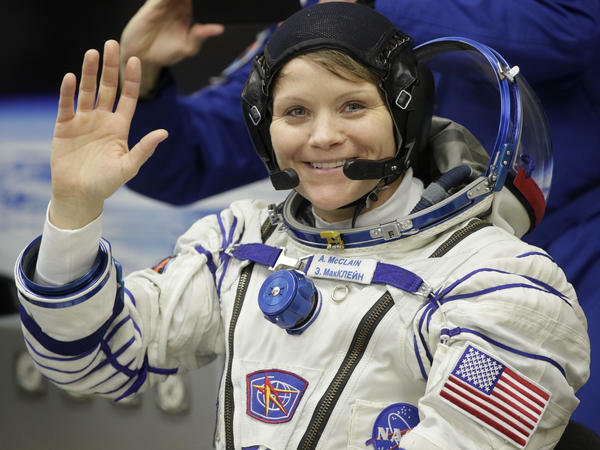 "When you are finally in space and you're finally looking back at Earth and you realize for the first time in your life there's nothing standing between you and your dream, it's just so hard to describe the profound impact of that," she said. McClain added: "Every day is a good day when you're floating. Your whole life you spend walking around Earth and then all of a sudden you get to fly like you've dreamed of." McClain and Koch were both part of NASA's 2013 astronaut candidate class, in which eight potential astronauts were chosen from more than 6,100 applicants. The class had an equal split between women and men. The availability of enough spacesuit sizes has long been a bit of a sensitive subject for NASA. As NPR's Nell Greenfieldboyce reported in 2006, opportunities for women may have been hampered by the fact that spacesuits only came in medium, large and extra-large sizes. They used to come in small, but that size was cut in the 1990s when NASA had to redesign the suits because of a technical glitch. That meant anyone who was on the smaller side wouldn't be able to make a spacewalk, astronaut Mike Fincke told Greenfieldboyce. And when the agency looked into the issue in 2003, it found that about a third of its female astronauts couldn't fit into existing suits. But Lara Kearney, who worked on the small suit, said it's not about gender, but rather about logistics and cost-effectiveness. "Do we spend around $15 million to accommodate, relatively speaking, a few more people than we could today? Or, do we take that money and turn it towards the suit development for the next generation?" NASA has no current plans for an all-female spacewalk, but given that 12 of the agency's 38 active astronauts are women, Schierholz told the Times she thinks it's only a matter of time. "We're sort of getting to the point of inevitability." A previous version of this story said that Anne McClain wore a large-size spacesuit torso during her spacewalk last week. In fact, she wore a medium.